What Are The Different Technologies? What Are The Challenges of Laser Technologies? Laser diodes are solid state components that convert electricity into light. Laser light differs from other light sources in that it is composed of a single color (temporal coherence) and that all light waves are sent in phase (spatial coherence). These coherences allow laser light sources to be focused to a tight spot and keep this narrow beam over a long distance (such as a laser pointer). Lasers can be all colors but video projectors will need red, green and blue to create every color. Laser lights concentrate a lot of energy on a single point. Depending on the power of the laser (Class 1 to 4), the laser beam can either be safe or damage the skin or eyes. Using laser digital cinema projectors offers several advantages. The narrow light beam of the laser concentrates a lot of light on the DMD surface. It allows laser projectors to create not only a brighter but also a better image with a significant increase in uniformity, contrast ratio and color gamut. In addition to creating bright pictures, laser diodes are also energy efficient. They produce more lumens than xenon models per consumed Watt. With their long lifetime, laser illuminated projectors reduce operational costs as no lamp replacement is needed. Laser diodes last from 20,000 to 40,000 hours and more depending of the usage conditions. It also suppress the risk of damaging the optical component due to lamp explosion. Laser diodes can be used in different ways in order to produce pictures. Depending on the way they are used, the safety regulations, lifetime and picture quality will be different. This technique is mainly used for outdoor laser shows. It allows bright pictures to be projected over a long distance. As the laser light is projected directly on the screen (or building), the picture quality will be impacted by significant speckle (see “What are the challenges of laser technologies?”). The audience will thus need to be seated far from the screen to avoid this problem being visible. With regard to safety regulations, the laser beam will still concentrate a lot of energy on the screen position, meaning there is a risk to eye safety for the audience from the projection position to the screen. A safety distance between the floor and the bottom of the light beam will thus be required along the whole projection path. This technique is therefore not suitable for front projection. This technique is mainly used for low to medium brightness projectors manufactured by NEC, Barco, Sony and Christie. Laser phosphor projectors use only blue laser diodes. Those lasers are cheaper and widespread as they are used in Blu-Ray players. In this case, the laser diodes are not used to create the picture directly but as a light source. The light beam emitted by a blue laser module is combined with a yellow light beam created by the reflection of the light emitted by a second blue laser module on a yellow phosphor wheel. The mix of these two light beams creates a white light beam sent to the light engine via the integrator rod. The picture is then created using the same process as a xenon projector. As the light beam reaching the light engine is more spatially coherent, it allows DLP* projectors to project a more uniform and contrasted picture than the DLP models using xenon or mercury lamps. Compared to direct scanning, the final picture on screen will have no visible speckle (see “What are the challenges of laser technologies?”). With regard to safety, as the laser light passes through the light engine, the light is diffused and becomes no more dangerous than the light produced by a xenon projector with the same brightness. The regulations are then reduced and a separation distance (between the floor and the bottom of the light beam) is only needed within the first meters (or centimeters) from the lens. This technique can be easily used in cinemas with small to medium auditoriums. It will provide constant light to the projectors for 20,000 to 40,000 hours with a dip of around 50% in brightness at the end of its lifetime. This technique is mainly used for high brightness projectors manufactured by Barco, NEC & Christie.RGB laser illuminated projectors use red, green and blue laser diodes as light sources. The laser beams emitted by the red, green and blue laser modules are combined to create a white light beam which is sent to the light engine through the integrator rod. The picture is then created using the same process as a xenon projector. The light beam reaching the light engine is even more spatially coherent than in laser phosphor illuminated projectors. The pictures projected by the RGB laser projector are thus more uniform and contrasted than those projected by DLP laser phosphor models. RGB laser illuminated projector models can be of two types: 3P (3 primaries) or 6P (6 primaries). “3P” or “6P” stands for the number of wavelengths used to create the white light. A “3P” RGB laser illuminated projector will use one wavelength for each laser module (one for the red laser module, one for the green and one for the blue) whereas a “6P” RGB laser projector will use 2 wavelengths per laser color. On the other hand, as the laser light does not pass through a phosphor wheel (“filter”), the speckle effect will not be reduced and may then be visible on screen. With regard to safety, the same principle as with laser phosphor projectors can be applied, as the laser light passes through the light engine and is diffused. “6P” RGB laser models allow exhibitors to use a dedicated 3D system creating amazing ghosting-free 3D images. This technique is therefore best suited to big auditoriums and PLF auditoriums. This technique is an alternative means of increasing brightness levels without using expensive RGB laser diodes. As stated earlier, blue and red laser diodes are inexpensive, particularly in comparison with their green counterparts, which are more difficult to produce. The concept is the same as for the laser phosphor model. The light beam emitted by a blue laser module is combined with a yellow light beam created by a second blue laser module installed behind a yellow phosphor wheel. The combination of these two light beams creates a white light beam sent to the light engine via the integrator rod. Adding a red laser to this white beam will increase the red saturation, making it easier to obtain DCI red. Less light is therefore lost in the DCI notch filter, enabling increased brightness capacity or reducing the size of the laser module for small projector. The introduction of these red laser diodes will increase the price of the laser light source as it will require additional cooling and may add some speckle on screen. This technique is best suited to cinemas with medium to large auditoriums. It will provide constant light to the projectors for at least 30,000 hours to with a dip of around 50% in brightness at the end of its lifetime. WHAT ARE THE CHALLENGES OF LASER TECHNOLOGY? Depending on the power of the laser diodes, the light emitted can be dangerous for the eyes and/or skin. Class 1 includes lasers up to 0.39µW. These lasers are safe if they are used in the conditions for which they were designed (DVD player, printer, laser phosphor projector, Barco High Brightness RGB Laser projector, etc.). Class 2 includes lasers between 0.39µW & 1mW. Lasers emitting visible light which is not dangerous for the eye as protection is insured by natural defensive reflexes (bar code scanner). Class 3R includes lasers between 1mW & 5mW. These lasers can be dangerous for the eye in some conditions. Class 3B includes lasers between 5mW & 500mW. These lasers are dangerous for the eye if looked at directly but diffuse reflections are normally safe. Class 4 includes lasers above 500mW. These lasers are dangerous for the eye and skin whether looked at directly or after diffuse reflection (high brightness RGB laser projectors with Optic fiber connection). Despite the class of laser diode, the light emitted after the lens is diffused and does not represent a higher risk than the light emitted by a xenon projector of the same brightness. Therefore, the regulation to be applied to laser illuminated projectors is the same as that applicable to xenon projectors of the same brightness of course. According to the brightness of the projector and the throw ratio (Lens), a Nominal Ocular Hazard Distance (NOHD) will be determined. This Nominal Ocular Hazard Distance (NOHD) is the distance from the projector at which the energy per surface unit is safe for the eyes and skin. Within this NOHD, a minimum Separation Height (SH) is needed between the floor and the bottom of the light beam. The minimum separation height is 2.5m in the US and 2m worldwide. If the Separation Height (SH) is not respected within the NOHD, a Restricted Zone (RZ) will need to be applied. This Restricted Zone (RZ) will include all seats present below the width of the light beam and those within the Separation Width (SW), which is 1m on each side of the light beam. A restricted area must be implemented in the projection booth to physically avoid people looking directly into the light beam. These constraints must be studied before the installation of any high brightness laser projectors in a cinema auditorium in order to insure the safety of the movie-goers. Speckle: If you have already studied a laser dot emitted by a laser pointer, you may have noticed that this dot is not uniform. It is composed of several smaller light dots that are brighter or darker than each other. This issue can also appear on laser illuminated projectors and depends on several factors. In the worst case scenario, this type of issue can create a shining pattern on top of the picture. Projector design: Increasing the number of wavelengths (3P vs 6P) will help to reduce speckle. Adding even more wavelength in the light beam (9P or Enhanced Wavelength Diversity from Christie) could also better reduce the speckle but only if wavelength selection is done correctly On the laser phosphor projector, the issue will not be important as a phosphor wheel is used to create yellow light (red + green). The green and red speckle will then be blocked by the wheel. Red and green being the colors mainly used to create white light, the speckle present on the blue part will not be visible to the human eye. Screen choice: As we need to create diversity, the lower the gain used the better, as it diffuses more light and thus reduces speckle. Distance from screen: The closer you are to the screen; the less diverse light enters in the eye thus creating more speckle. CinemaNext has participated in the early installations of laser projectors since 2014. 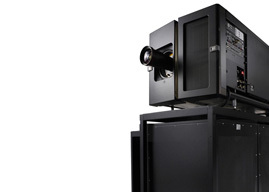 The first Barco RGB laser projector was installed in the Netherlands by the CinemaNext team (JT Hilversum), who were also part of the first Dolby Cinema in Europe using Christie RGB Laser projection (JT Eindhoven). Based on this experience, we are starting to deploy laser illuminated projectors within Europe in countries such as the Netherlands, Denmark, Spain, UK, France etc. including several full laser sites. The Barco Laser projector DP4K-60L is also illuminating the biggest cinema screen in France (Villeneuve-la-Garenne’s Megarama). Motivated by the positive feedback from their audiences, the Megarama group decided to continue improving the quality in their Horizon auditoriums by adding more Barco RGB laser projectors. At CinemaNext, each laser installation is analyzed to ensure you have the best picture quality based on your budget and requirements. Our team can help you select the appropriate technology to amaze your audiences. *If you require more information on DLP technology, please click here.